Newly-hired Penn State wide receivers coach Gerad Parker spent the 2017-18 seasons at Duke. James Franklin fired wide receivers coach David Corley less than 24 hours after the Citrus Bowl. And little more than a week later Gerad Parker is already in place. Based on a report I got from Durham, Franklin didn’t drop the ball. Parker’s path to State College was a bit circuitous, especially in the days since Franklin and Parker met face-to-face on Oct. 29, 2016, in West Lafayette, Ind. Parker was Purdue’s interim head coach that day. And up to a 17-17 halftime score, his Boilermakers gave the Nittany Lions all they could handle. But then JoeMo opened the floodgates, and Penn State scored 45 second-half points to win 62-24. Since then, Parker finished out the 2016 season at Purdue, was at Cincinnati for less than three weeks, was set for a job at East Carolina but never made it there after a DUI charge, then spent the past 21 months at Duke. Where he got rave reviews. Parker takes over a receivers room that just lost 193 career receptions, 2,405 receiving yards and a dozen TDs: DeAndre Thompkins (83-1,245-6) to graduation and Juwan Johnson (81-1,123-2) and Brandon Polk (29-367-4) to the Transfer Portal. He’ll be greeted by a host of young, talented receivers who will be catching passes from a quarterback — be it Tommy Stevens, Sean Clifford or a TBA — with little college game experience. 1. Parker jelled well with Duke head coach David Cutcliffe, a passing game savant. Parker joined the Duke staff in May 2017 as a football operations assistant for offense, and was promoted to wide receivers coach in January 2018, when Duke added a 10th full-time assistant. 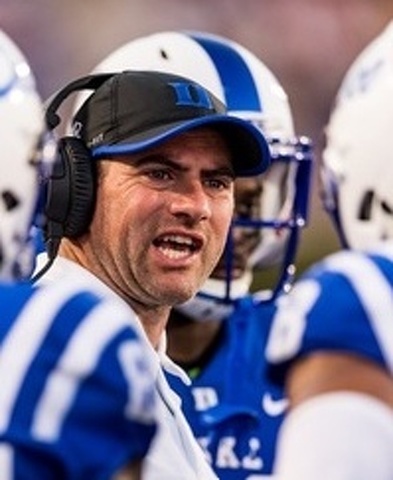 He spent two years working under Cutcliffe, who tutored Eli and Peyton Manning and also developed Daniel Jones, Duke’s starter the past three seasons and a certain first-rounder in the 2019 NFL Draft. At Duke last season, Parker’s leading receiver, Y.J. Rahming, had 75 catches for 811 yards, with eight TDs, while the No 2 receiver, Johnathan Lloyd, had 51 receptions for 604 yards and five touchdowns. According to a good source I trust at Duke, Parker was a star in his short time under Cutcliffe. The Blue Devil wide receivers “improved significantly” under Parker, who was also seen as an excellent recruiter. He left under very good terms with Cutcliffe, with whom he had a good working relationship. 3. Parker has a degrees-of-separation thing with David Corley that would make Kevin Bacon proud. One is obvious: He replaces Corley, who was fired one year into his two-year contract with Pen State. Two: Keith Gaither was the Army wide receivers coach in 2015-2016. Gaither left West Point in January 2017 to take the WR coach’s job at Temple. He was replaced by…Corley, who was hired to be the Army wide receivers coach for the 2017 season before coming to Penn State. There’s more: When ECU opted not to hire Parker as its WR coach in February 2018, they turned instead to Gaither — who subsequently left Temple and was hired as East Carolina’s wide receivers coach in March 2018 (the job Parker thought he had). 4. Parker coached at Marshall with Ju’Juan Seider, Penn State’s second-year running backs coach. At Marshall in 2011 and 2012, Parker was the wide receivers coach while Seider coached the running backs and was recruiting coordinator. Marshall was 7-6, averaging 21.8 points per game, in 2011 and was 5-7, averaging 40.9 ppg, in 2012. 5. Parker coached at Purdue with John Shoop, Bob’s brother, in 2013-15. During that time, Shoop was the Boilermakers’ offensive coordinator. Parker coached the Purdue tight ends in 2013-14 and the wide receivers in 2015-16. In their three years together, Purdue had a 6-30 record and averaged 14.9, 23.8 and 25.1 ppg. 7. Parker was 0-6 as Purdue’s interim head coach in 2016. After Darrell Hazell was fired as head coach midway through the season after a 3-3 start to season, and a 9-33 career record with the Boilermakers overall (3-24 in the Big Ten), Parker was winless in six games at the top. The losses: At No. 8 Nebraska, 27-14; No. 24 Penn State, 62-24; at Minnesota, 44-31; Northwestern, 45-17; No. 6 Wisconsin, 49-20; and at Indiana, 26-24. 8. What Franklin said about Parker before the 2016 Purdue game… “Purdue, obviously with a coaching change there. I thought their staff reacted really, really well to Coach Parker. Their team reacted really well to Coach Parker. They went to Nebraska, Top-10 team, and were winning at the half. “So you talk about a team that’s reacted well, played really hard and played with really good energy. On offense, they throw the ball really well. They are the No. 1 team in the conference on throwing the ball. Kind of a controlled passing attack, medium range, short passing game. Do a really good job with those things. They have two receivers that can hurt you. “He’s made a lot of changes in their program and how they practice and how they prepare from an energy perspective, from a time perspective, from a focus perspective, from all those types of things. “That would be safe to say. I think so. You know, you’re on fire so much to climb a ladder when you’re younger. To climb, to climb, to climb. But sometimes you forget the whole ride when you go. “Then when you get an opportunity like this it is a little bit unique — or a lot unique….it does at least, for sure, remind me, that, One, I would certainly love to do this permanently one day. And then, it also has given me and afforded me the opportunity to look at some things in a different lens of I get sometimes what a head coach is thinking and has to put up with: This isn’t — you always think about it’s me and the money and all me, me, me. It’s not. “This is about how well you can serve your staff and your players. In my opinion, if you do that well, you can make a lot of people’s lives happy. Players are going to be happy ad they are going to become the men, players and team you want them to be. Your staff and their wives and their families are going to be happy. That’s a pretty powerful thing to have if you use it the right way. 2010 — Tennessee-Martin, WR coach, pass game & recruiting coord. 2013 — Purdue, TE coach, recruit coord. 2014 — Purdue, TE coach, recruit coord. 2015 — Purdue, WR coach, recruit. coord. No. 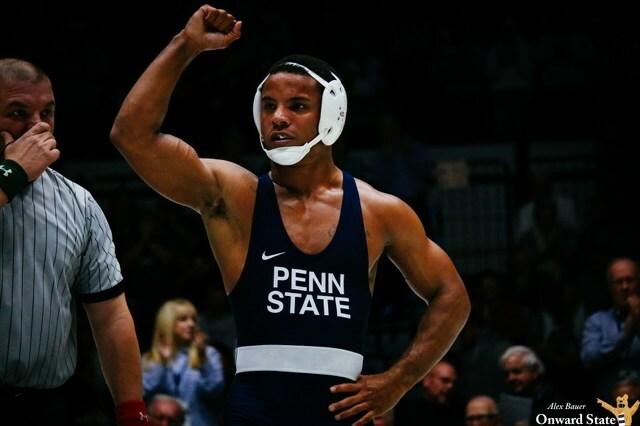 1 Penn State wrestling survived its first scare of the season against No. 19 Wisconsin Sunday afternoon at Rec Hall. The Nittany Lions trailed at three different points in the dual and as late as the sixth bout, but managed to pull away for a 24-13 win against the Badgers.